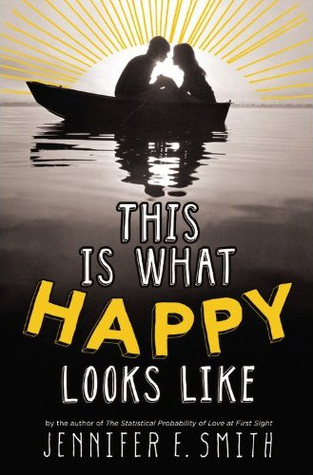 In This is What Happy Looks Like, Jennifer E. Smith's new YA novel, perfect strangers Graham Larkin and Ellie O'Neill meet—albeit virtually—when Graham accidentally sends Ellie an email about his pet pig, Wilbur. In the tradition of romantic movies like "You've Got Mail" and "Sleepless in Seattle," the two 17-year-olds strike up an email relationship, even though they live on opposite sides of the country and don't even know each other's first names. Through a series of funny and poignant messages, Graham and Ellie make a true connection, sharing intimate details about their lives, hopes and fears. But they don't tell each other everything; Graham doesn't know the major secret hidden in Ellie's family tree, and Ellie is innocently unaware that Graham is actually a world-famous teen actor living in Los Angeles. When the location for the shoot of Graham's new film falls through, he sees an opportunity to take their relationship from online to in-person, managing to get the production relocated to picturesque Henley, Maine, where Ellie lives. But can a star as famous as Graham have a real relationship with an ordinary girl like Ellie? And why does Ellie's mom want her to avoid the media's spotlight at all costs? In case you didn't know, "You've Got Mail" is a movie about two bookstore owners (YES! BOOKSTORES! :D) who are rivals. Kathleen Kelly (Meg Ryan) owns a small children's bookshop which is slowly being put out of business by Joe Fox (Tom Hanks) with his big, new, super-size store, Fox Books, which sells cheap books. Yet, unknown to these two rivals is the fact that they have been communicating with one another - and are falling in love - online! Wow, this looks sooo good! And I have to tell you that You've Got Mail is also one of my favorite movies! I've seen it about 100 times and it never gets old. This is the second time I'm seeing this book today. Glad cause i like the plot. never heard of that one, but it also doesn't seem to be ny gendre anyway. Hope you enjoy it when you get it. I've never watched You've Got Mail, although this book kind of reminds me of a Meg Cabot book I read where a teen star pretends to be "normal" in a school. Teen Idol I believe. I really enjoyed that. HOWEVER, this sounds so much more EPIC! I want it NOW! I mean NOW! I haven't heard of this, but literally I cannot wait until 2013 for this book. I have no clue who the author is or anything else, except this book sounds downright awesome! Sorry for my gush rant, but it's been a while since I've seen a WoW other than my own that I've wanted so much. I can't believe I missed this book!! This is going on my TBR right this second. It sounds a lot like The Statistical Probability of First Sight, which I really enjoyed! I'm already looking forward to this one. Awesome pick! I hadn't seen anything about this novel until now, but I too also loved Statistical Probablilty so I'll definitely be checking this one out as well!! I love the sound of this one!! New follower. I'm really looking forward to this book! I loved Statistical Probability so I'm hoping this one's great too. Great pick! Thanks for stopping by my WOW!